I’ve been on a roll, trying to finish up all my UFOs before this baby shows up and takes up all my knitting time. It’s felt really great- kind of freeing- to clear out my Ravelry WIP list (not to mention the shelves in my studio where I keep my WIPs-there’s so much more room in there!). And, so, the time has come for me to really buckle down and get to work on the White Whale of my WIPs… The one that keeps getting away (or rather, the one that I keep intending to work on but then get bored with and do something else instead). The infamous Papaya Sweater! 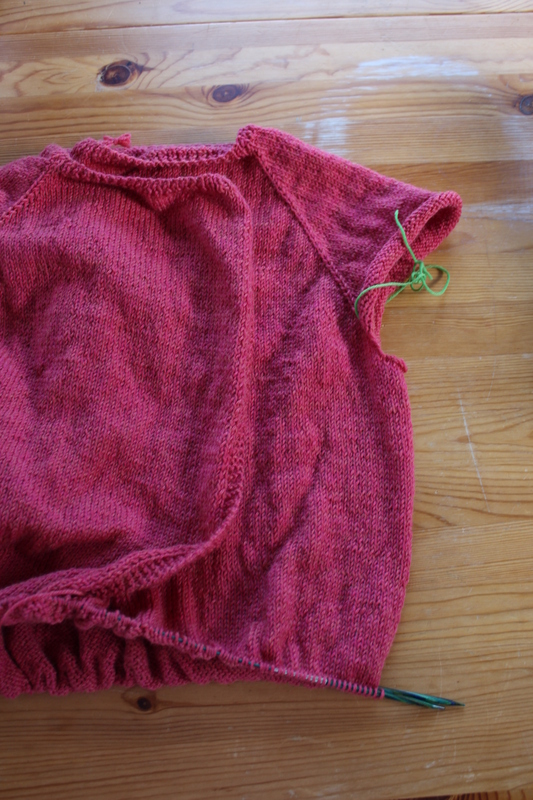 I’ve been working on it all week, and I’ve managed to cruise through a skein and a half of stockinette for the body. And, it’s looking surprisingly good! I’ve got 10 inches of body so far, which feels like a great start. I’m going to take a break from the body at the end of this skein, work up the arms, then use the rest of my yarn to see how long I can make the body. I can’t say it’s terribly interesting knitting (it’s just miles of stockinette with a little bitty garter stitch border), but it’s simple and satisfying. 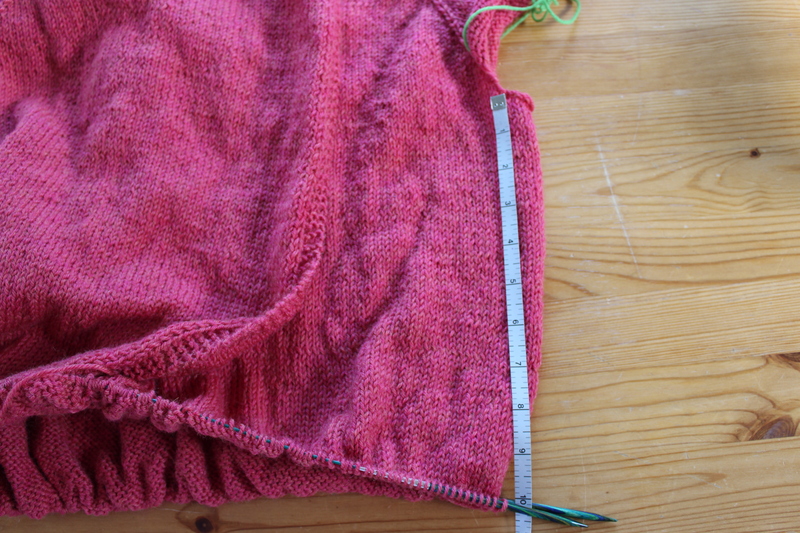 Plus, it’s kind of fun to see how big/long of a sweater it’s going to end up being. I hope it gets massive! Do you have any “White Whale” Projects in your stash? What’s keeping you from finishing them up? This entry was posted in On My Needles and tagged cardigan, knitting, knitting wips, papaya, papaya sweater, sweater, wip, wips on March 9, 2018 by onemilljellybeans. I am making an Aran Cardigan for my adult son. He picked the pattern, out of some I showed him. I have never knit an Aran, and even though I have been knitting for 37 years, I have knit very few adult sized sweaters. I am a hat, mittens, scarves, socks, baby knits kind of girl. So…we got the yarn and I cast on. I know have a good system. A good system is one that works for me. And I dedicate several hours every Sunday to knitting it. If I can fit in more time, I do. Much of my knitting time is interrupted time. The sweater is a project that must have uninterrupted time. So…I am making progress! Your sweater is lovely. I would call that sweater ‘mindless’ knitting. A good movie, Netfix tv series, a good audio book helps me with mindless knitting. Can’t wait to see the FO. I think you’re both awesome, knitting adult-size sweaters! I have a afghan that I started on a couple summers ago. It’s pretty easy and goes relatively quick, but my edges got really wonky and so I just let it sit. It’s now sitting in my closet and peeks out at me often with sad eyes of a forgotten toy. I really need to just finish it, put a border on it to even out the wonky and add tassels. But, still it sites. Not to mention the other afghan that is finished and we’ve been using, but is still waiting for tassels as evidenced by the long threads still hanging from the edge.